My names Ellie and up until two weeks ago I neglected my hair. There i've said it, I admit I have always been rubbish with hair and 'maintaining it' as such I would abuse my hair on a daily bases with heat and would only occassionally use heat protection if I remember. Oh the shame. 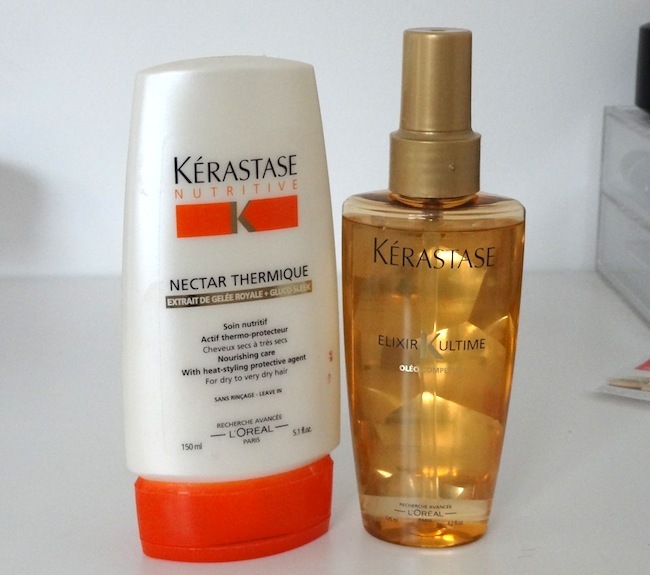 But fear not this has now all changed since Kerastase Elixir Ultime has come into my life! Since I have started blogging I have started to have serious hair envy, I want smooth glossy locks which don't look lifeless! So my first step on the path of beautiful hair was to book a haircut with a good hairdresser and actually spend some money on my hair. While there he used this oil on my hair, and said he preferred it to the morroccan oil, which I can't comment on as I have never tried it. There are two ways I used this oil, one is when my hair is damp I squeeze a bit of the Kerastase Nectar Thermique (another new find) into my hand and then squeeze a pea size drop of the oil into it, mix them together and rub into my damp hair. Normally that is enough but sometimes afterwards I will squirt a small amount into my hand and lightly run it through my dry hair. The thing with this product is less is more! You need the smallest amount for the best results. I am so impressed as well with how light this oil feels, as with anything that has oil in the name I automatically expect it to be thick and greasy. The results you are wondering? My hair is smooth, with less fly aways, feels healthier and smells so good! 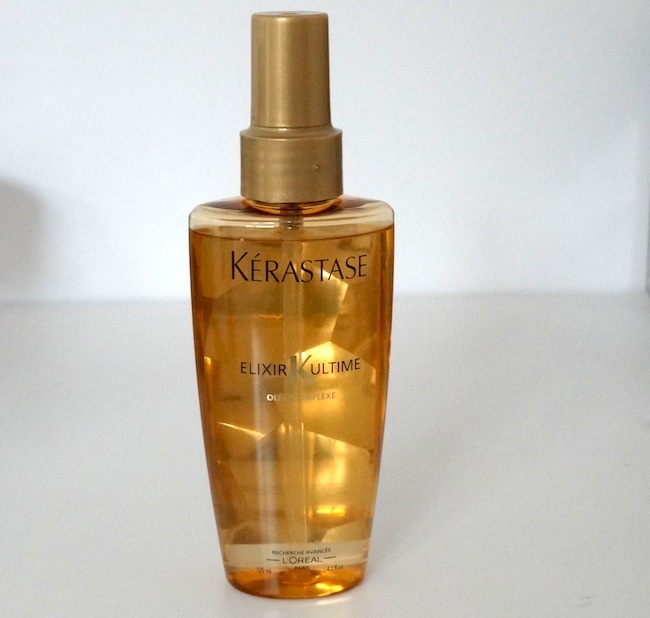 Kerastase Elixir Ultime is pricey, but in my opinion completely worth the money and it will last you a long time. You wear your hair every day so it is worth investing in :) I have been converted and will from now on look after my hair better! Have any of you tried this? As I mentioned in my NOTD post I was kindly invited to the Nails Inc Event* on Thursday, where I got to drool over the new collections and meet lots of lovely bloggers :) Nails Inc have really hit the ball out of the park with their 2012 collections it isn't often I find a Nail polish company where collection after collection there are nail polishes that I want and that are different enough to justify getting them all! 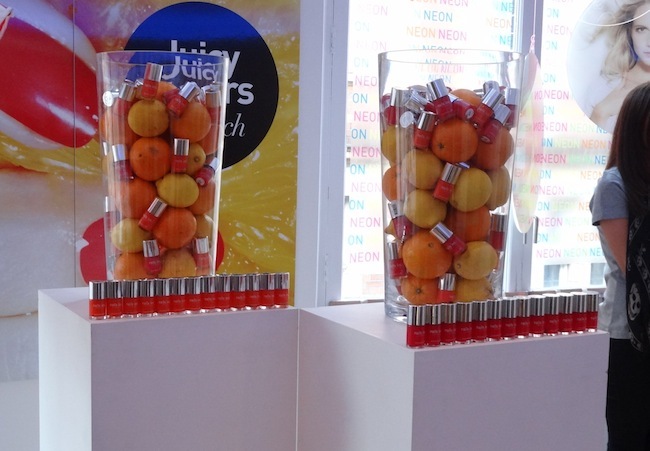 The Juicy Collection which is displayed in the photo above consists of two colours, Chelsea Flower Show which is the orange shade and Henley Regatta the juicy pink colour. 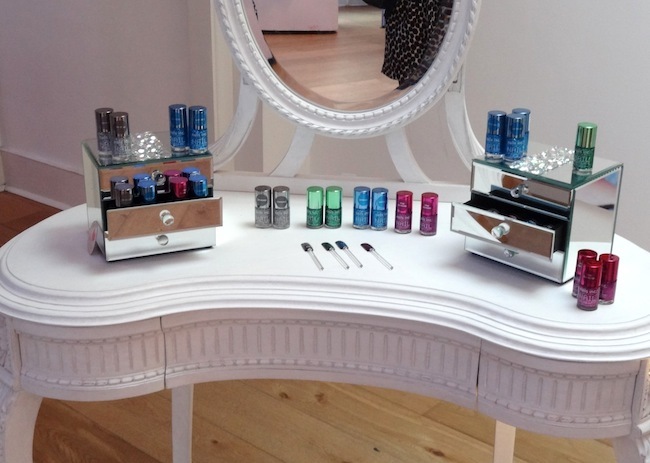 These nail varnishes are designed to be a high gloss sheer pop of colour with one layer but also build able to achieve a bright pop of colour. 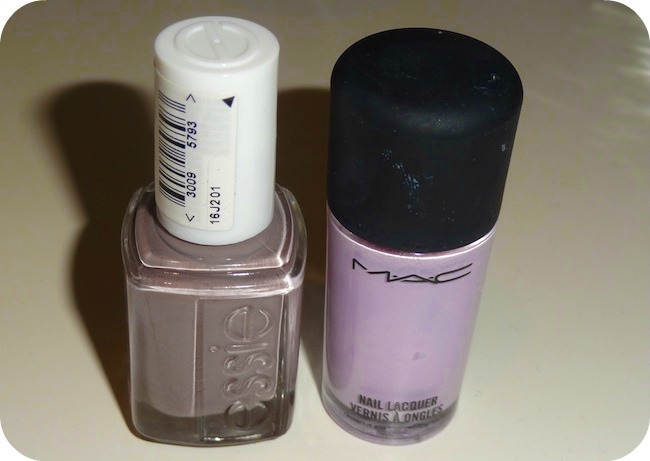 Now I love a glitter nail polish so I was like a magpie when I saw these polishes! These are from the New Nail Jewellery collection which will be available in shops by the end of April. These have a 'revolutionary formula' as they have been created by hand cut particles, giving the same effect as a precious stone. These polishes are an instant nail statement, the above glitters are layered over Black Taxi, I personally think the Diamond one looks like cut ice on your nails which is such an unusal and cool effect. The colours available are Piccadilly Arcade- Emerald, Burlington Arcade- Diamond, Royal Arcade - Sapphire and Princes Arcade - Pink Diamond. If you own Baker Street or the 'Beyonce Blue' that it has been nick named then Royal Arcade would look amazing layered over the top of it to give the perfect effect of having sapphires on your finger nails. I'm sorry this photo is not the greatest but this is the Metallic range, consisting of three colours Gold,Silver and Bronze. This will come in a set on a little podium giving reference to London presenting the Olympics and will cost £25. This will be released in June so plenty of time for you to snap it and start wearing before the Olympics take place. The colour that I'm most excited about in this collection is Horseguard's parade which is the bronze and in real life looks like the most perfect and gorgeous rose gold colour *swoon*. 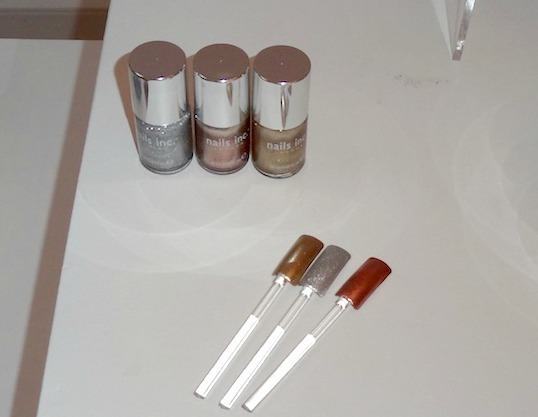 The gold colour is called Wembley and the full coverage metallic silver colour is called Greenwich Park. 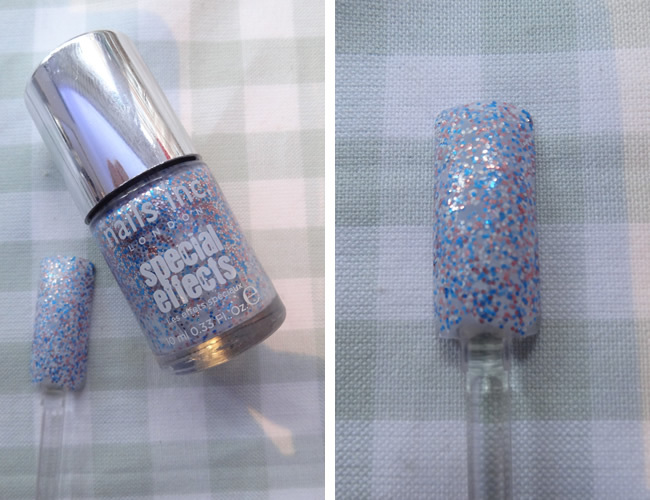 The Sprinkle Collection is the collection which excited me the most. 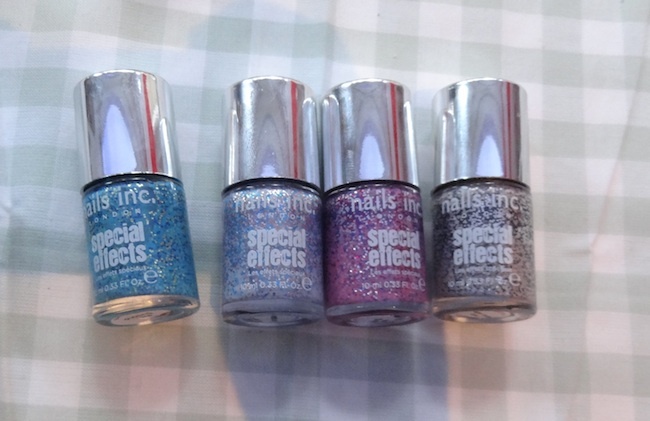 I want all four of these colours when they are released the formula of these is great, you have opaque nails in two coats due to these 'mattified' glitter polishes having an opaque base coat. 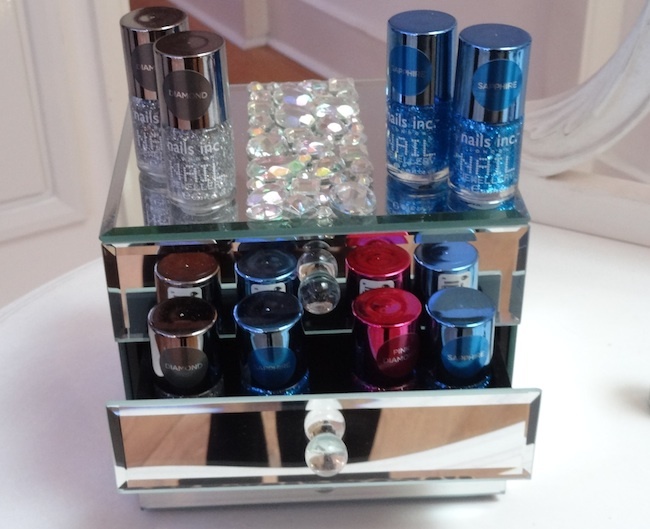 These nail polishes are like nothing else I have seen before, they give the most stunning effect it makes it seem as if you have hundred and thousands sprinkled on your nails :) . Also they don't feel rough on your nails like most glitter polishes do as it seems like the glitter is set inside the polish, giving a jelly like effect. 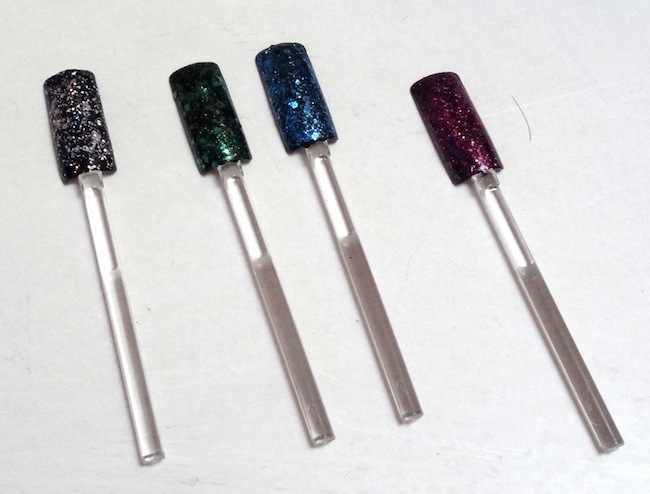 The shades from (L-R) Pudding Lane - Teal with navy and gold glitter, Sweets Way - pale blue with pink and white glitter, Topping Lane - pink with fuchsia, silver and blue glitter and Sugarhouse Lane - pastel grey with monochrome glitter. This collection will be released in June and I will be first in line to buy them all! One final collection that Nails Inc are releasing is a Neon range, which I will get swatches up of soon, as I have been playing around with a few of these colours. Phew this is a long post I told you Nails Inc had been busy there are lots of collections and I think there is something for everyone. Has anything have caught your eye? What is your favourite collection? I hope you have enjoyed your weekend! I had such a nice relaxing weekend doing my usual Sunday routine of going to China Town yum yum, no chicken feet this week though! haha. I wore this outfit on Saturday, as I have had this jumper for a good 6 months now and never actually worn it out (hides face). I have just used it to wear round the house on my lazy days as I find it just that too short to wear with jeans it cuts me off in the wrong place. But I layered it over my trusty Topshop blouse and decided to rock the shorts and tights look after loving in it my other OOTD. Once I put my bodywarmer on which again I hadn't worn in so long I realised just how preppy the whole look seemed! But on the plus side I was very warm which is what you need with the unpredictable weather we are having! Sugarhouse Lane - pastel grey with monochrome glitter. Pudding Lane - teal with navy and gold glitter. What do you think of Sweets Way? 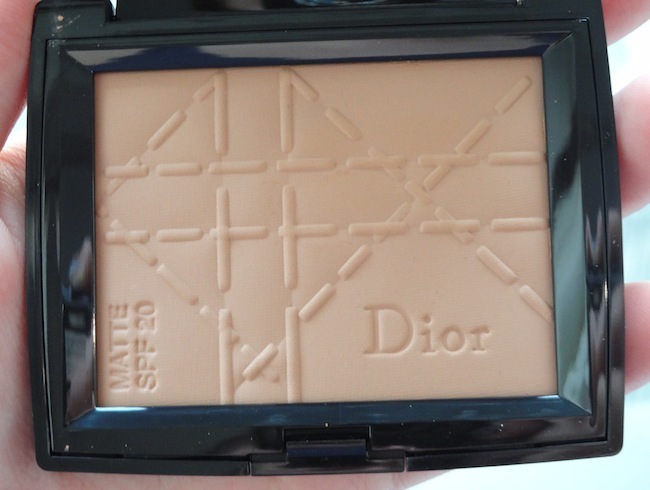 This week’s product of the week is my new Dior Matte Sunshine Bronzer in Honey. I bought this bronzer about two weeks ago, because as you can see in my picture above my Bourjois Paris one has died… well been ruined! I’m not a major bronzer girl due to the fear of looking like I have smeared mud across my face, so the Bourjois Paris one was a good place for me to start due to it not being very pigmented but just enough for a slight glow. I’m not sure how but it seems water has got on this bronzer and made it disgusting so it was time to upgrade! 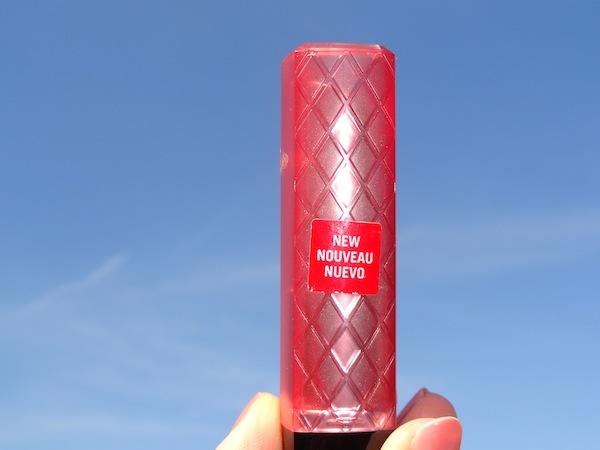 I knew that I wanted a matte bronzer and while doing my research I know a lot of people love the Nars Laguna one but I wanted something different, and I can't get boots points either with Nars (im obsessed!). Then after falling in love with my Dior Amber Diamonds I thought I would try one of their bronzers. 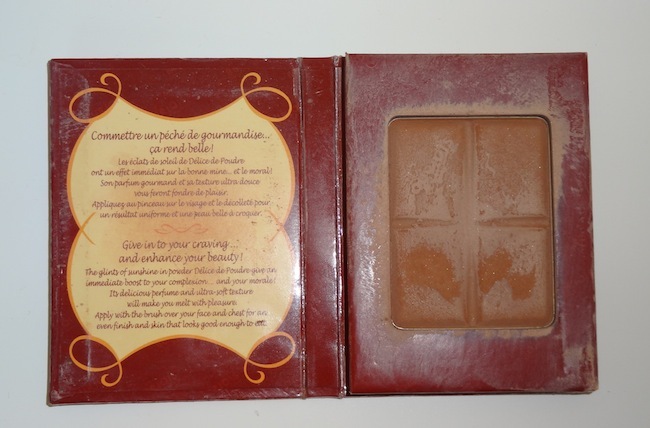 This bronzer has SPF 20 in it, not that it’s really needed at the moment with this horrendous weather we are having but it is will be good when it is sunny. 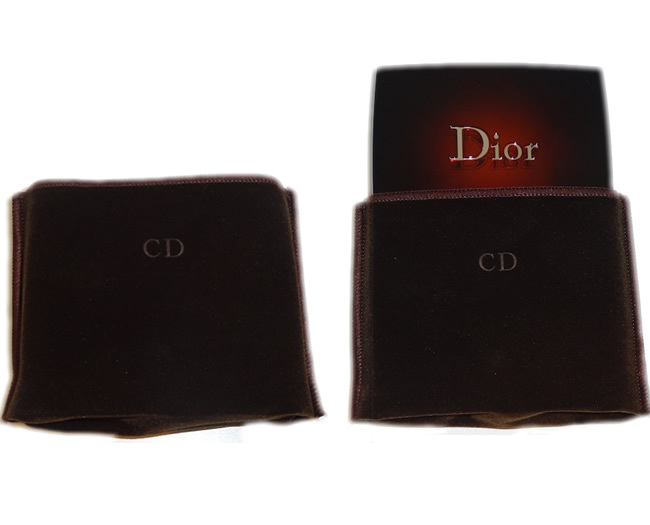 One thing I love is that the packaging is brown rather than the traditional blue due to it being part of their Dior Bronze line, it makes it stand out more especially if you have a few Dior products. In the pan it is not scary or orange looking, the first picture is in artificial light and the second is in natural daylight, I think the second photo is a much better representation of what it looks like in the pan. This is a really lovely natural bronzer, that I can wear every day as it gives me a nice bronzed glow but not so much so that I am feeling paranoid that I’m orange! Haha. 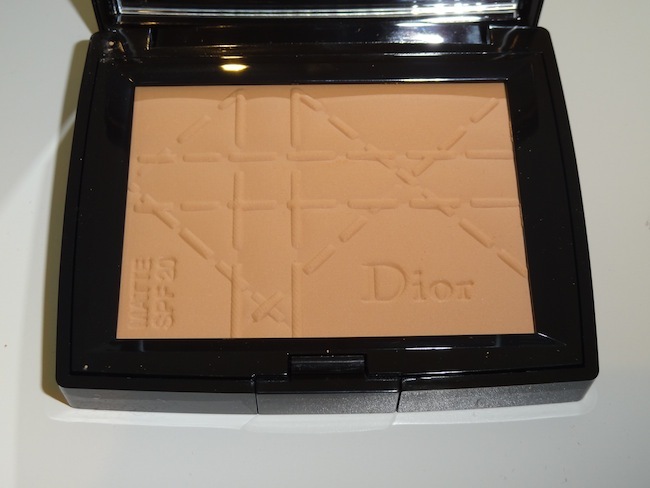 As with all Dior products it feels very soft and pigmentation is great. I am really pleased with this bronzer and who knows this could convert me into a bronze-a-holic ;) Have any of you got this Bronzer? If so what do you think? Just a quick one today to let you know I have uploaded a new video. I have really enjoyed filming a few videos recently and editing them, I have had to blow the dust off my media studies skills and put what I learnt for 2 years to the test! haha. If anyone has done this video or has a youtube channel, then leave your links in the comment section as I love finding new blogs and youtubers :) I hope you have a good and slightly soggy Thursday! If you are interested in this shade you may be best looking on ebay for it as I know a lot of people have been able to get hold of them there or if you know someone going to the states i'm sure if you ask them nicely they would get you one! So what do you think, are you disappointed this wasn't in the UK release? 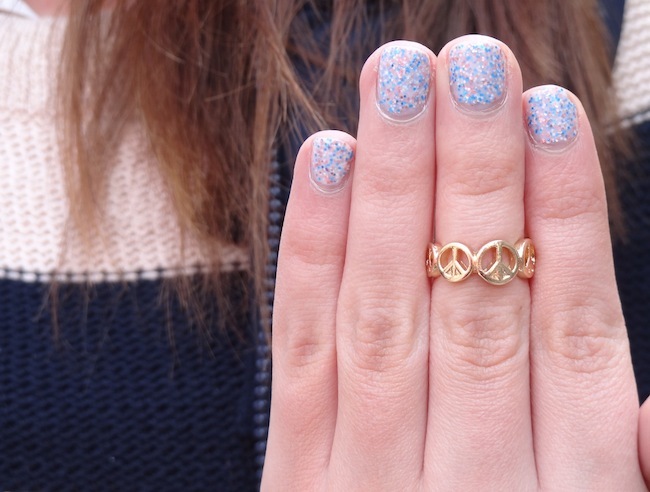 A really quick post to show you what I am currently wearing on my nails. I know polka dots are not ground breaking or original but I had some spare time on my hands last night, and wanted to wear this lilac ( Little Girl Type LE) but not all over my nail so I decided to pair it with Essie Chinchilly and I love how the colours look together! I was only going to do polka dots on my ring finger but I loved how it looked so much I went wild and did it on all of them haha! 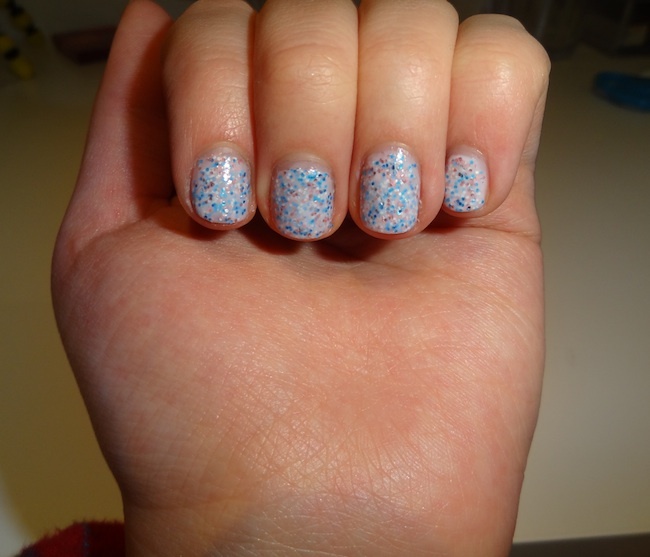 I just used the end of a cuticle stick to make the polka dots as I don't own a nail dotting tool. Also sorry that the photos aren't the greatest but I had to take the photos last night even though the lighting was poor as I was worried I would chip them today, it is Friday 13th after all! haha. What do you think? I hope you have all had a lovely easter break and eaten lots of chocolate! I finally could eat chocolate as I gave it up for lent but once I could eat it again it just didn't taste as good as it used to, boo! Maybe that habit has finally been kicked haha! Anyway this is an outfit I wore to go shopping with my friend to sunny Brighton on Friday. 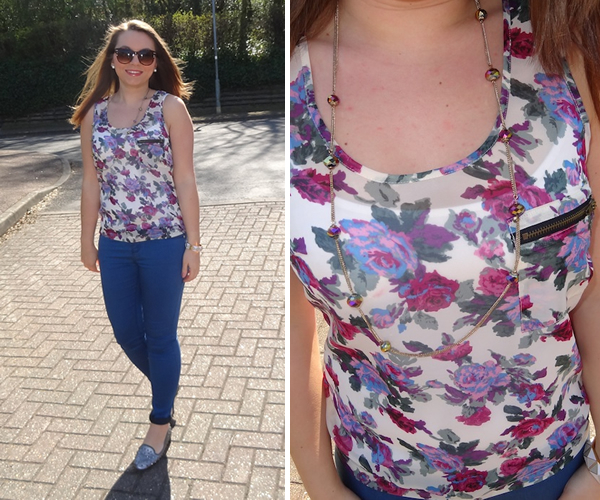 It is such a shame that the weather has turned so horrible as Friday was lovely, which made me choose to wear a floral top to embrace spring :) Nearly everything I am wearing are new purchases which I did show in my haul video. 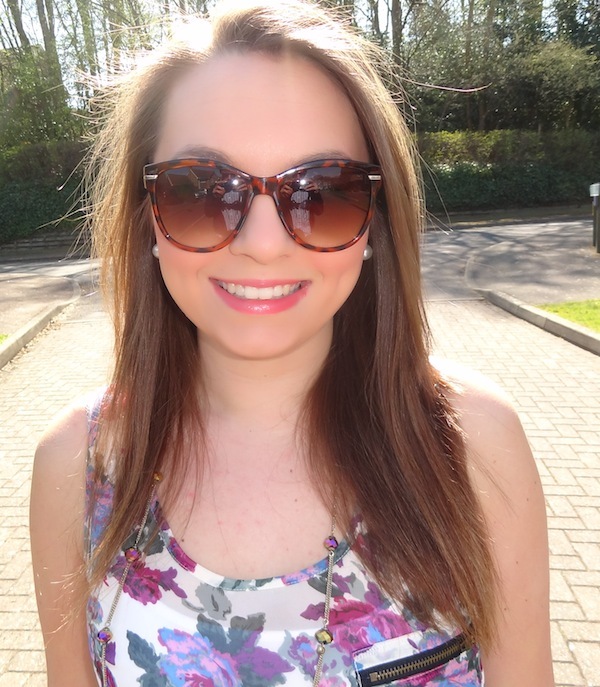 I love the sunglasses which are only £4.99 from h&m I just thought they were a fun shape and add that little touch to an outfit, I know quite a few people have them in black but I decided on tortoiseshell as it always looks softer on my face :) Finally I am also wearing my trusty Revlon Lip butter in Macaroon, I told you it was my favourite! 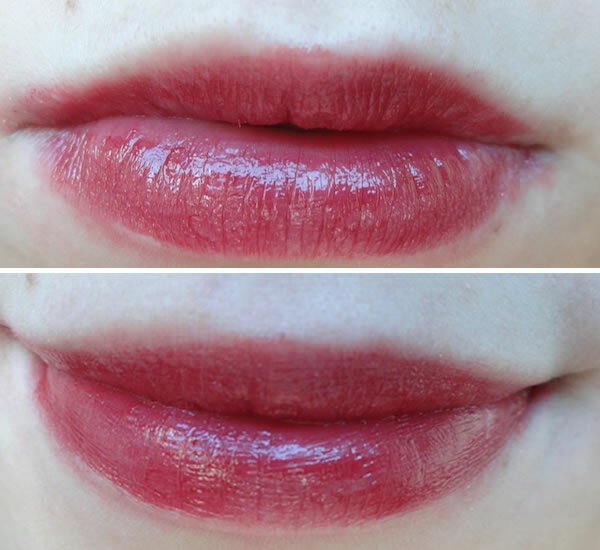 I know you guys are probably sick of hearing about the revlon lip butters, as they are the product of the moment but I can't not talk about the Lip butter in Macaroon. 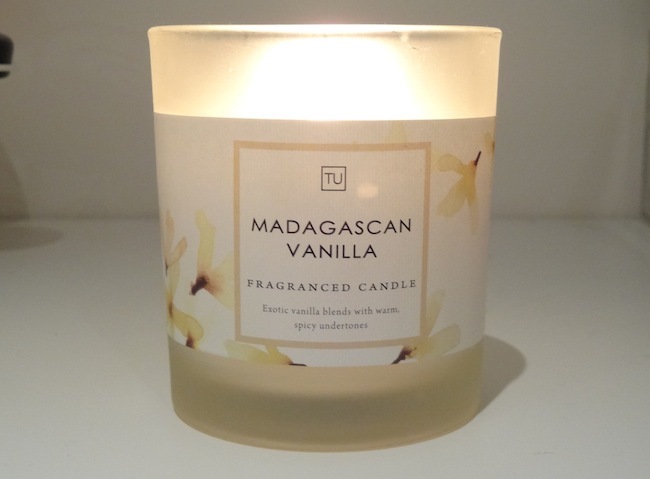 This one is an exclusive colour to the UK, I mean they had to make it up to us somehow what with not releasing the full collection over here, but boy does this make up for it all! As soon as I laid eyes on this colour on thesundaygirl blog I just had to have it, that blog is such an enabler in most purchases! 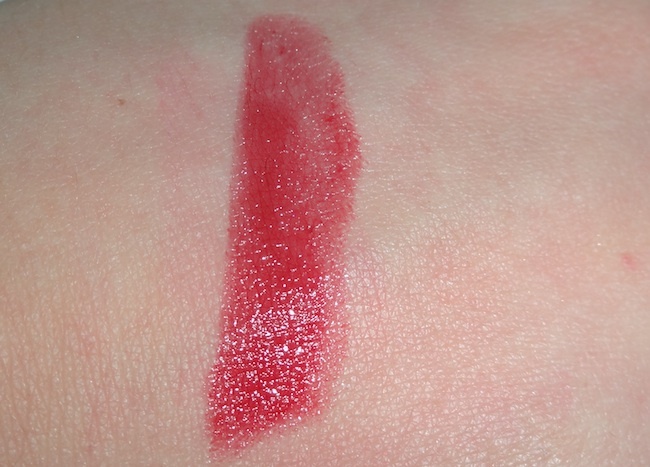 I have worn this colour nearly every day since I bought it 10 days ago, every other lip product has been pushed aside I'm thinking I will need to buy a back up asap. 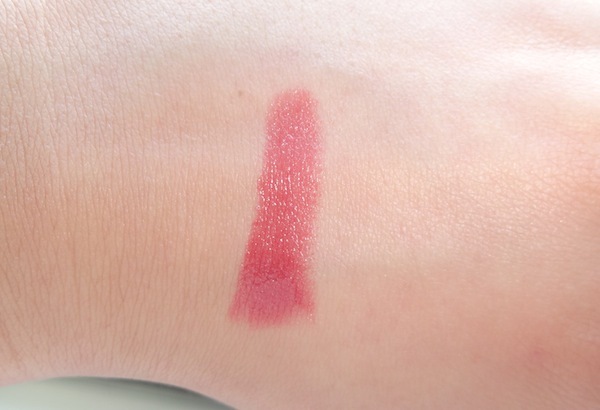 It is the most lovely dusty pink colour with small shimmer running through it and is very wearable for the day. I find this colour really lifts my face, and goes with so much. Now that spring has arrived I really like wearing brighter colours compared to my usual favourite which is Mac Lovelorn a pale pink. 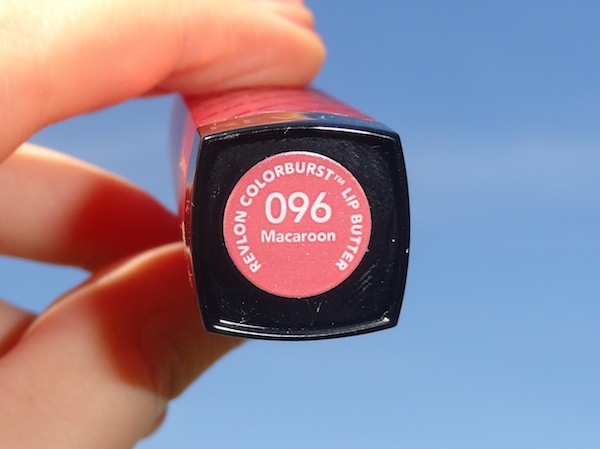 The pigmentation of Macaroon is amazing it is one of the better ones a long with Lollipop, and very moisturising. I find this lasts about 3 hours on my lips, but is still leaves a slight stain. Have any of you got Macaroon? This is my first ever youtube video, I thought I would ease myself in with doing a Haul with my recent spring purchases :) I hope you like it, I know it may sound odd but I always find it interesting hearing what bloggers sound like in real life and think it is a good way to get to know someone's personality. I know it is very long but once the camera was rolling I couldn't stop talking! I hope some of you do enjoy it and find it interesting and it would be great to have some of your feedback! How was your weekend? Did you enjoy the sunshine? I know I probably say this every Monday but where did the weekend go?! I was having so much fun, boo Monday. 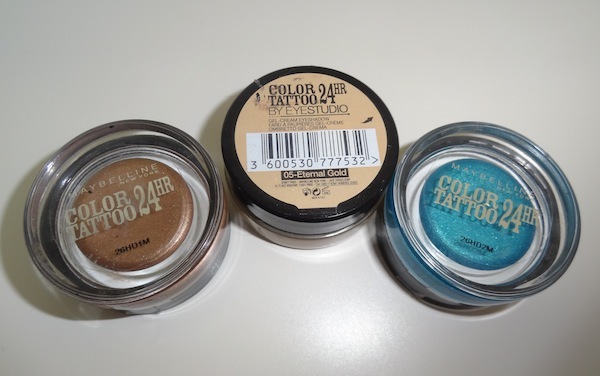 Anyway I bought these Maybelline 24 hour tattoo eyeshadows over two weeks ago, if you follow me on instragram (elliemaydoll) then you would have seen a photo but I wanted to use them for a while to give a real review on them. I bought these three in Superdrug when they did 3 for 2, but individually they are £4.99. Packaging wise these come in a sturdy jar very similar to the Mac paint pots, I'm not sure if the pot is glass or sturdy plastic but either way they look nice and feel good quality. My favourite out of the three has to be On and on Bronze ( on the left) this is a lovely bronzed taupe (depending on the light) with small gold shimmer running through it and one that looks really nice on the lids. Eternal Gold is a pure gold colour, all though in the pot it looks like a very yellow gold on the lids it isn't but this eyeshadow is very shimmery. Turquoise Forever is a dark turquoise nearer to a blue colour again with a small amount of shimmer. This is the poorest pigmentation wise compared to the others, you have to build it up a lot to get its true colour. 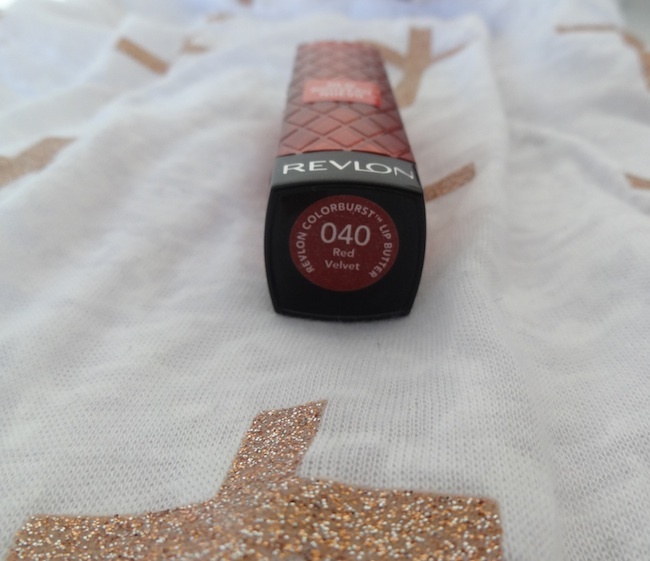 I honestly only bought this one as it was 3 for 2 in superdrug and I liked the colour, but I wouldn't personally wear this as a shadow I would wear it as an eyeliner. 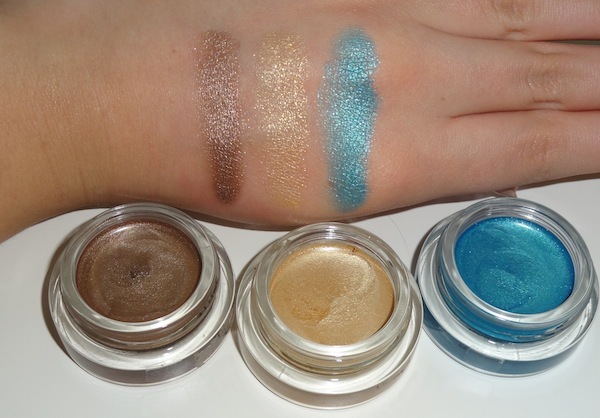 I never wore these eyeshadows for 24 hours as well that is disgusting! But I wore them by themselves for a good 8 hours and they did last well, there was a little creasing and fading especially with On and On Bronze. I think if you wore an eyeshadow over the top and used these as a base they would last longer. Over all they are good value for money and a very good alternative and much cheaper than the Mac paint pots! Have you got any of the Maybelline 24 hour tattoo's?